In Canada, as in the rest of the world, flat track racing is back with a vengeance. Aaron Hesmer’s Flat Track Canada series continues on its mission to pull flat track racing out of the dark ages. Hesmer is an affable, soft-spoken, not-quite 30-year-old who (along with his wife Katalin) dedicates an immense amount of time to make flat track in Canada mainstream motorcycle competition. That’s a tall order, but if anyone can do it, it’s Hesmer. Hesmer’s “I’ve got a bike if you want to give it a go” approach suckered me back into flat-tracking last year. It also lured fast guys like Canadian Superbike champ Jodi Christie and his chum, middleweight winner Kenny Riedmann, to give it a go. Christie, in particular (and as no great surprise) took to it like a fly to a fly strip. “I like it a little too much,” Christie confessed. And so he should. Flat track’s current resurgence is the most significant since, well, since forever. That guys named Rossi and Marquez do it to help their road racing is reason enough to tempt the pavement lads to give it a try. We’ve even heard that road race madman — and all around sweetheart — Trevor Daley wants to see what the fuss is about. 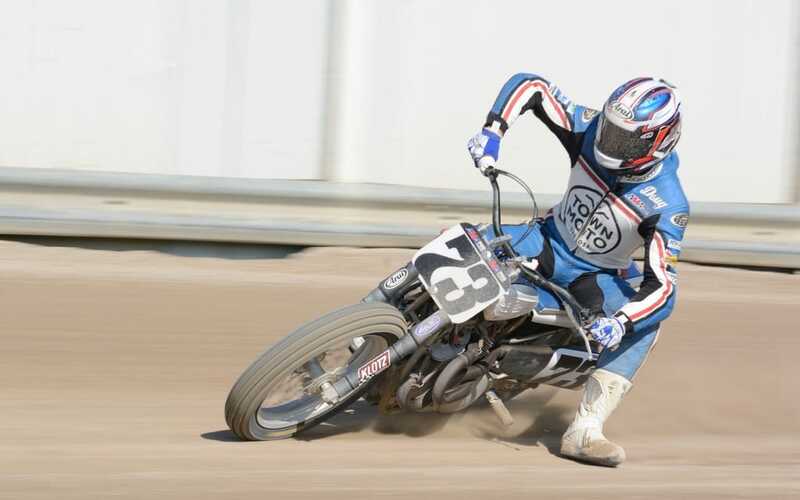 In Flat Track Canada’s short history Don Taylor has been the man to beat, and, as my chum CSBK boss Colin Fraser astutely pointed out, Taylor is perhaps the only racer in the world that you’d pay money to watch practice. Taylor stuffs the front wheel of his XR-750 into a corner as aggressively as a man drowning a cat in a toilet bowl. It’s horrible. And thrilling. For 2015 Hesmer has added a race at the Parts Canada Walton TransCan Grand National Championship, which is the country’s largest amateur and professional motocross event. Other stops on the schedule include Ontario half-miles at Leamington, London, Woodstock, and Paris, in addition to short track races at, among other venues, the Welland County Motorcycle Club grounds near Niagara Falls, Ontario. Knowing that you can’t build a national series if you never leave Southwestern Ontario, Hesmer is hoping to stimulate flat tracking by forming liaisons with enthusiasts in Alberta and to expand Flat Track Canada into Quebec in 2016. Visit flattrackcanada.com for the full schedule, including dates for Friday nights at the Paris short track.